LUSH is one of those places I mistakingly only ever associate with selling funky bath products, and I forget they offer an abundance of products from skincare, bath & body, beauty, to name a few. It can be easy to just be lured into their colourful array of bath bombs and bubble bars, and boom, shop done. I seriously advise you to seek out their little black tubs of goodness, however. They may not be as enticing as the bath bits, but there are some great little gems hidden away. I popped into my local branch at the weekend and picked up a new face mask I had my eye on, and seduced by a seriously fab hand scrub. The face mask in question is their Cup O' Coffee, which acts as a caffeine boost for your skin. It's encouraged to be used in the morning, but it feels a little alien to pamper yourself that way first thing in the morning, especially if you're in a rush to get out the door! You'd think it smells like a big old cup of coffee too, but it actually smells very rich and chocolatey - basically good enough to eat! There are crushed cocoa beans to exfoliate your skin, buffing away dead skin cells to reveal gorgeous, glowing, healthy skin. In the past I've found scrubby exfoliators to be a little too abrasive, and often leave my skin feeling parched afterwards. This does the total opposite, and leaves your skin ridiculously soft and smooth. The vanilla is antibacterial and soothes the skin; kaolin draws out impurities; coffee is a stimulant and anti-inflammatory; and coriander oil wakes your skin and facial muscles up. I think this would be a fantastic product regardless of age and skin type, as it really brightens the skin leaving it looking plump and healthy, which is something we all want to appear, right? The new Salted Coconut hand scrub took me by complete surprise! I'm not really a huge coconut fan, but this is rather mellow and in fact, smells more like Playdough with a very faint, gentle hit of coconut. This is a salt based scrub, enriched in the wonder product, coconut oil, meaning your hands will be ultra smooth. You only need a little dollop - about the size of a 10p coin - massage it into all the nooks and crannies of your damp hands and then rinse off. It reveals incredibly soft hands, which is perfect for these cooler months if your hands get a little dry. I like to apply a layer of my favourite hand cream after, just to lock in the hydrating properties from the coconut oil, and for a long lasting smooth finish. My Mum was so impressed by the results that she picked up a little tub too! It seems like a total luxury product, and a little unnecessary, but trust me, you need this! My hands haven't felt this soft for a long time! It may sound a little OTT but this has to be the product my hands have been waiting to get hold of! Yes, it's that good. 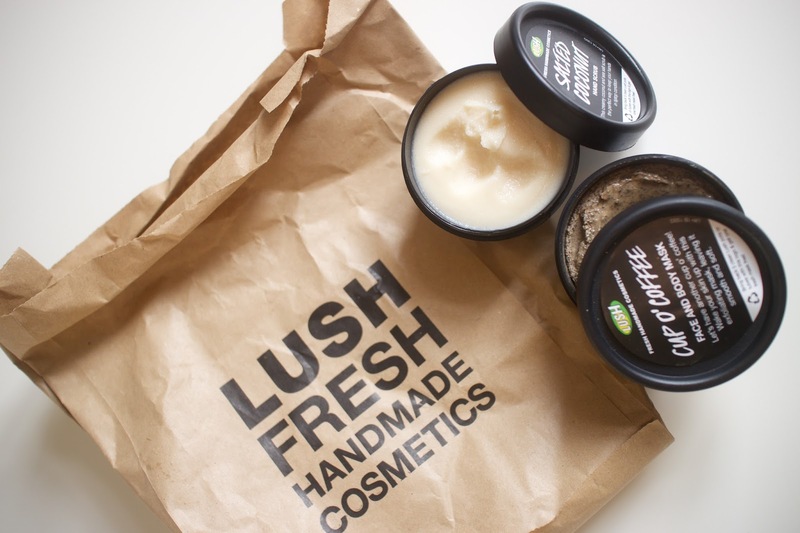 Have you tried any new LUSH products recently? Do you have any favourites that you've used in the past? Have you tried any of their skincare products and if so, what are your thoughts?